This weekend, the annual WonderCon comics, gaming and fandom event takes over the Anaheim Convention Center, offering attendees a jam-packed schedule of screenings, signings, sneak peeks, panels and portfolio reviews. Here are some of our recommended picks to make the most of the event. Fri. 5 p.m. Transformers: Cyberverse, Going Cyber A behind-the-scenes look at writing Transformers: Cyberverse Season 1 from Cartoon Network and Hasbro Studios. The conversation will include the Cyberverse writing team: Gavin Hignight, Zac Atkinson, Mae Catt, Dan Salgarolo, story editor Randolph Heard, and Hasbro Studios’ Mikiel Houser and will be moderated by Jack Conway (Comic-Con Film School 101). The team will discuss the creation of Season 1 and give you a peak at what’s to come in Season 2! Fri. 6 p.m. Writing for Animation Have you ever wanted to write cartoons for a living? If so, you’ll want to listen to a panel of folks who have actually done it and done a lot of it. Come and hear from moderator Mark Evanier (The Garfield Show, Thundarr The Barbarian), John Semper (Spider-Man: The Animated Series, Static Shock), Julien Magnat (The Garfield Show, Ben 10), and others. Fri. 7 p.m. WORLD PREMIERE Justice League vs. The Fatal Five Warner Bros. Home Entertainment, DC, and Warner Bros. Animation continue the treasured tradition of Friday night world premieres at WonderCon with the unveiling of the latest DC Universe Movie! Be in the first live audience to see the film, then stay for an enthralling panel led by Elyes Gabel (Scorpion, Game of Thrones) as Thomas Kallor/Star Boy, and Diane Guerrero (Orange Is the New Black, DC Universe’s Doom Patrol) as Jessica Cruz/Green Lantern, alongside a trio of actors reprising their beloved Justice League/Justice League Unlimited roles as Batman, Wonder Woman, and Superman, respectively: Kevin Conroy (Batman: The Animated Series, Batman: The Killing Joke), Susan Eisenberg (Injustice 2, LEGO DC Super Heroes Aquaman: Rage of Atlantis), and George Newbern (Superman vs. the Elite, Scandal). The panel will also include other cast members and the filmmaking team of producer/director Sam Liu (Reign of the Supermen, Gotham by Gaslight), screenwriters Eric Carrasco (Supergirl, Justice League Action) and Jim Krieg (Batman: Gotham by Gaslight), and executive producer Bruce Timm (Justice League/Justice League Unlimited, Batman: The Animated Series). Fri. 8 p.m. The Robotech Panel Harmony Gold USA presents the latest developments in the Robotech universe, from awesome new products to the live-action film in the works at Sony Pictures with the producers of 300 and the director of Stephen King’s It. Sat. 10 a.m. Into the Spider-Verse: A New Take on Animation Taking fans by storm, Spider-Man: Into the Spider-Verse was unlike anything seen before. From its perfectly balanced soundtrack, to the unique animation style that brought a comic book feel straight to the silver screen, it delighted audiences around the world. Jessica Tseang (comic book historian, AMC’s Secret History of Comics) discusses what made this film stand out from countless other animated movies with Sony Animation Visual Development artists for Spider-Man: Into the Spider-Verse Yuhki Demers and Zac Retz, and other special panelists. Sat. 10 a.m. DreamWorks She-Ra and the Princesses of Power Executive producer Noelle Stevenson, Aimee Carrero (Adora/She-Ra), AJ Michalka (Catra), Karen Fukuhara (Glimmer), Marcus Scribner (Bow), Lauren Ash (Scorpia), and Merit Leighton (Frosta) give attendees a sneak peek of Season 2 of the critically acclaimed Netflix original series She-Ra and the Princesses of Power. Everyone’s invited . . . even Kyle! Sat. 11 a.m. A Look inside The Dragon Prince The team behind Netflix Original animated series The Dragon Prince is bringing you an inside look into the magic of the show. Panelists include creators Aaron Ehasz and Justin Richmond, along with the voice actors of your favorite family of villains: Jason Simpson (Lord Viren), Racquel Belmonte (Claudia), and Jesse Inocalla (Soren). With Seasons 1 and 2 behind them, you’ll get to hear about how they got to where they are now and what’s on the horizon for the future of The Dragon Prince. Sat. 11:30 a.m. Hasbro and IDW Present: The Transformers Panel Transformers comics are reborn in the all-new Transformers series-and Transformers hall-of-famer John Barber and editor David Mariotte are here to introduce you to this bold new era and to celebrate 35 years of our favorite Cybertronians with surprise panelists from the past, present, and future of Transformers! Sat. 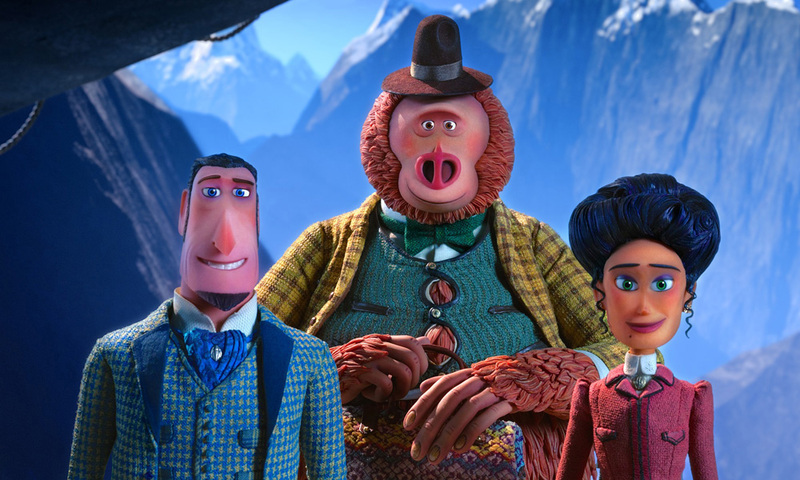 11:30 a.m. LAIKA Writer/director Chris Butler will share how LAIKA’s 360 stop-motion animation has evolved throughout their history, culminating in their upcoming global adventure film Missing Link, featuring the voices of Hugh Jackman, Zoe Saldana, and Zach Galifianakis. Joining Chris Butler are producer and head of production Arianne Sutner, production designer Nelson Lowry, and puppet fabrication supervisor John Craney for an exciting conversation with moderator Alicia Malone. Sat. 12 p.m. DC Super Hero Girls Video Presentation and Q&A Fresh off their brand-new series on Cartoon Network, the DC Super Hero Girls are coming to WonderCon. Executive producer Lauren Faust (My Little Pony: Friendship Is Magic, Foster’s Home for Imaginary Friends) and the vocal cast of Kimberly Brooks, Kari Wahlgren, Nicole Sullivan, Grey Griffin, and Myrna Velasco share new footage and answer your questions! Sat. 1 p.m. Crafting Cartoons and Comics: The Sights and Sounds of Your Favorite TV and Film Characters Learn how animated and comic book films and television shows are adapted, designed, and composed in this behind-the-scenes look at the production and development process for your favorite projects. Part 3 of 3 from Impact24’s “Behind-the-Camera Superblock” panel series. Panelists include animator David Han (Spider-Man: Into the Spider-Verse), animation director Anna Hollingsworth (Unikitty! ), supervising director Mike Hollingsworth (BoJack Horseman), supervising director Mike Mayfield (Big Mouth), and composers Brian H. Kim (Star vs. the Forces of Evil), Ryan Shore (Star Wars: Forces of Destiny). Moderated by voice actors Vanessa Marshall (Justice League: Crisis on Two Earths, Young Justice) and Chris Villain (content creator). Sat. 3:30 p.m. Happy Birthday, Batman! Calling all Batfans! You are cordially invited to Batman’s official birthday bash! Join an all-star panel celebrating the Caped Crusader and his many incarnations across film, television, animation, games, and comics. Be there to wish the greatest superhero of all time a happy birthday. Sat. 4 p.m. Reimagining The Twilight Zone for the Modern Audience When The Twilight Zone debuted in 1959, it became a worldwide phenomenon through its used socially conscious storytelling to explore the human condition and culture of the times. The godfather of sci-fi television, the show explored humanity’s hopes, despairs, prides, and prejudices in metaphoric ways conventional dramas could not. The upcoming reimagining of The Twilight Zone from executive producers Jordan Peele and Simon Kinberg is coming to CBS All Access April 1. Hear from series producers and creative minds behind the series for an exclusive sneak peek and discussion on reintroducing The Twilight Zone to a modern audience. Sat. 5:30 p.m. Cartoon Voices Once again, moderator Mark Evanier brings together a team of experts in the art of speaking for animated characters, interviews them, and has them demonstrate what they do. The panel this time includes Jon Bailey (Transformers: Combiner Wars, Bumblebee), Phil LaMarr (Futurama, Samurai Jack), Alicyn Packard (Tom & Jerry, Poppy Cat), Rachel Butera (The Adventures of Rocky and Bullwinkle, Teenage Mutant Ninja Turtles), Jim Meskimen (Avengers Assemble, Teenage Mutant Ninja Turtles), and maybe a surprise or two. Sat. 6:30 p.m. Animation Superstars ASIFA-Hollywood is bringing together some of the brightest talents in animation to discuss the animation industry, tips on how to break into the industry, and challenges and triumphs along the way. 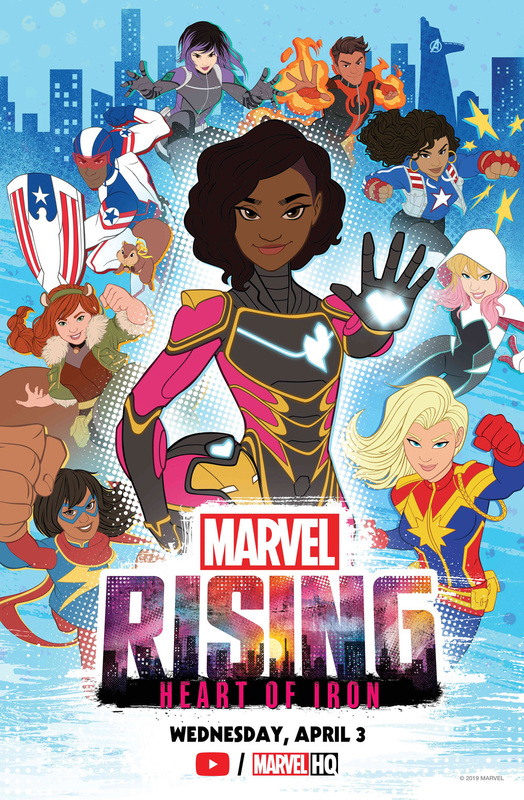 Panelists will include Peter Ramsey (Spider-Man: Into the Spider-Verse, Rise of the Guardians), Jorge Gutiérrez (Book of Life, El Tigre, upcoming Maya and the Three), Daron Nefcy (Star vs. the Forces of Evil), Jeanette Moreno King (Alien News Desk, Enchantment, Futurama), and Alonso Ramirez Ramos (Disney’s Mickey Mouse Shorts, Steven Universe Movie). The panel will be moderated by ASIFA-Hollywood vice-president Brooke Keesling. Sun. 10:45 a.m. Remembering Stan Lee Fellow fans remember the life and legacy of the legendary Stan Lee. Starting with the Fantastic Four for Marvel Comics in 1961, Stan (together with fellow co-creators, artists Jack Kirby and Steve Ditko, et al.) brought to life the Hulk, Doctor Strange, Daredevil, and our favorite neighborhood Spider-Man! This panel will celebrate Stan the Man with a collection of fan art and the best of his cameos in the Marvel Cinematic Universe, plus stories of those who knew Stan and his genuine appreciation for his fans. Sun. 12:30 p.m. Demon Creation to City Extensions: Storytelling Through VFX Cutting-edge VFX have reached a level where anything that can be imagined can be taken from script to screen. From demonic possessions to city extensions, VFX industry leader Crafty Apes works on everything from sci-fi shows to period features. The team behind fan-favorites including Stranger Things, The Orville, Legion, Doctor Strange, Deadpool 2, and Ant-Man and the Wasp will dive into the ways in which visual effects shots were crucial to the storytelling process. Sun. 1:30 p.m. The Bumpy Road: From Animation Student to Animation Professional Do you have what it takes to break into the field of animation? Every year students graduate with degrees in animation, but only a fraction of them end up landing a job in the business. Competition is fierce, and if you want to get your career started, you have to be prepared and ready to hit the ground running. In this panel discussion, producer Stephen Worth is joined by designer/storyboard artist JoJo Baptista and educator Taber Dunipace to offer tips that lead to success and advice on how to avoid common pitfalls. If you hope to pursue a career in animation, you won’t want to miss it. This panel is brought to you by Animation Resources, a 501(c)(3) non-profit educational organization serving animators, cartoonists, and illustrators. Sun. 1:45 p.m. WORLD PREMIERE: Batman vs. Teenage Mutant Ninja Turtles Be the first live audience to witness this tantalizing team-up at the World Premiere and its star-studded post-screening panel. The Batman vs. Teenage Mutant Ninja Turtles all-star cast is led by Troy Baker (Batman: Arkham Origins, The Last of Us) as the voice of both Batman and the Joker, making Baker the first actor to ever play both roles in the same film. Opposite Baker are the Ninja Turtles themselves: Emmy Award/Golden Globe Award/SAG Award-winner Darren Criss (American Crime Story: The Assassination of Gianni Versace, Glee) as Raphael, Kyle Mooney (Saturday Night Live) as Michelangelo, Baron Vaughn (Grace and Frankie) as Donatello, and Eric Bauza (Looney Tunes Cartoons, The Woody Woodpecker Show) as Leonardo. Other key members of the voice cast include Rachel Bloom (Crazy Ex-Girlfriend) as Batgirl, John DiMaggio (Adventure Time, Futurama) as Mr. Freeze, Tara Strong (Batman: The Animated Series, Teen Titans, Teen Titans Go!) as Harley Quinn and Poison Ivy, Tom Kenny (SpongeBob SquarePants) as Penguin, Carlos Alazraqui (Reno 911!) as Bane, Cas Anvar (The Expanse) as Ra’s al Ghul, Keith Ferguson (Foster’s Home for Imaginary Friends) as Baxter Stockman and Two-Face, Brian George (Seinfeld) as Alfred, Ben Giroux (Hart of Dixie) as Robin, Andrew Kishino (The Lion Guard) as Shredder, and Jim Meskimen (Parks and Recreation) as Commissioner Gordon and Scarecrow. 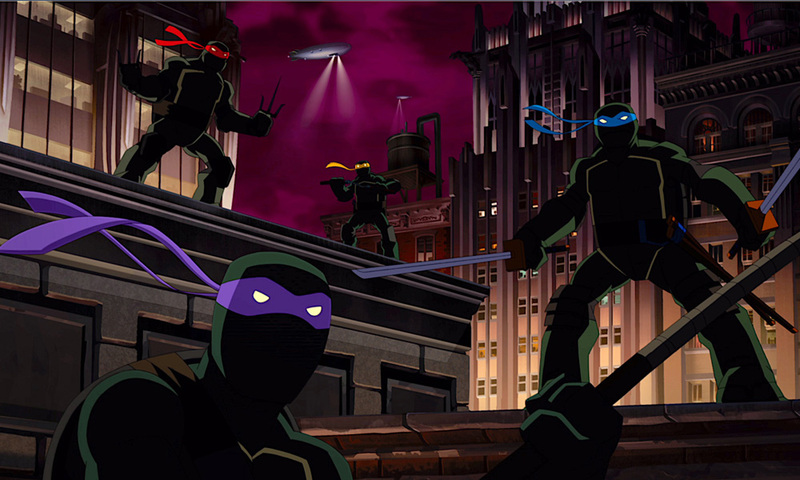 Jake Castorena (The Death of Superman) directs Batman vs. Teenage Mutant Ninja Turtles from a script by Marly Halpern-Graser (Mad, Batman Unlimited, Be Cool, Scooby-Doo). Sun. 2 p.m. Archer: 1999 Advanced Screening and Q&A Archer is FXX’s Emmy Award-winning, animated comedy that, in its upcoming 10th season, centers around the spaceship M/V Seamus as Archer, Lana, and the rest of the crew explore deep space and try to outsmart space princes, intergalactic pirates, and vicious bounty hunters. Come see a not-to-be-missed exclusive sneak peek at the upcoming season and the voice cast of H. Jon Benjamin, Aisha Tyler, Jessica Walter, Judy Greer, Chris Parnell, Amber Nash, and Lucky Yates, plus executive producers Matt Thompson and Casey Willis as they discuss bringing this animated series from script to screen.